The collection of articles “Prospects for Arms Control, Disarmament and Nonproliferation. 70 years after the Hiroshima and Nagasaki atomic bombings” has been published with the support of the National Research Institute of World Economy and International Relations named after E.M. Primakov of the Russian Academy of Sciences (IMEMO RAS) and the Russian Pugwash Committee under the Presidium of the Russian Academy of Sciences. A number of articles within the publication were presented as reports and communications at the 9th International Student/Young Pugwash (ISYP) Conference (Nagasaki, Japan, October 2015), and at the section “Nuclear policy, security and conflicts” organized by the Center for Euro-Atlantic Security of the Moscow State Institute of International Relations (MGIMO University) together with the Russian Pugwash Committee in the framework of the 9th Convention of the Russian International Studies Association (Moscow, Russia, October 2015). I n 2005 International Student/Young Pugwash (ISYP) issued its vision statement in Hiroshima: “Mission possible: engaging a new generation.” Ten years later, and sixty years after the Russell-Einstein Manifesto, ISYP reiterates its call for peaceful co-existence in the face of the uncertainty of the contemporary age. Over the past decade the world has seen the spread of conflict and risk. Regional stability is elusive in many parts of the world. Military conflicts continue to rage in volatile areas. Nuclear proliferation remains a real threat and disarmament still appears a distant goal. Terrorist attacks around the world continue and are increasing in sophistication and brutality. Technological advancements have made it easier to wage war. Climate change continues to accelerate. 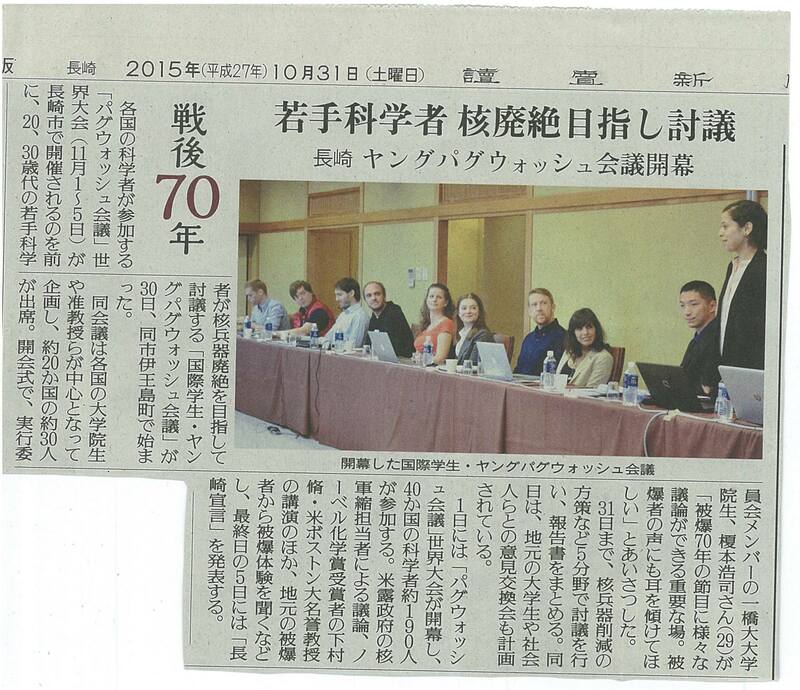 The 9th International Student/Young Pugwash (ISYP) conference, “Prospects for Arms Control, Disarmament, and Nonproliferation: 70 years after the Hiroshima and Nagasaki atomic bombings,” was held in Nagasaki, Japan from October 30 to 31, 2015. The conference included 31 participants from 19 countries who presented papers on a broad range of subjects: regional security issues in Asia, Europe and the Middle East; nuclear disarmament; nuclear-weapon-free zones; the importance of non-state actors and institutions in the de-legitimization of nuclear weapons; and other issues central to the mission of ISYP and the Pugwash Conferences. The International Student/Young Pugwash (ISYP) network convened a workshop involving aspiring young scholars to discuss ways in which ISYP specifically can be strengthened and how more generally the network of young people working on disarmament and non-proliferation can be enhanced. 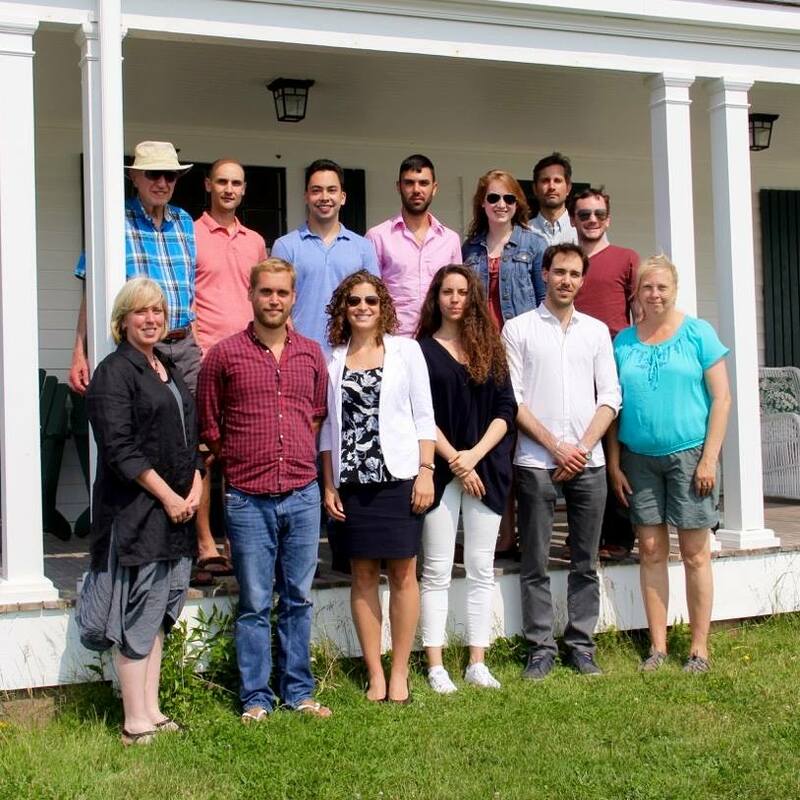 The setting of Thinkers Lodge, Nova Scotia, location of the first ever Pugwash Conference in 1957, played an inspiring location for generating one-and-a-half days of productive discussion and thinking.